On the edge gardening is about the life and times of a 5 acre garden on the North Devon coast. The garden is a mix of wood and more formal planting on terraces supported by beautiful dry stone walls. We also have a vegetable garden, fruit and a lovely Edwardian greenhouse. Part of the garden is open to the public from April to September under the National Garden Scheme. The structure of the garden (very steep with steps everywhere) means everything has to be carried or barrowed, no tractors here. We have no direct sun from mid November to mid February and we are painfully exposed to wicked north/north easterly winds. Apart from that its all pretty plain sailing really! Love your blog,it’s like have a natter over a cold pint at the ends of more days than you’d ever get chance to really! Always like to peek in when struggling up coast path from Lee Bay, presume you are garden on left on hillside. Will be down again last week in March, will you be open then as we love walk from Ilfracombe to Mortehoe via Lee ? Any progress on Lee bay Hotel yet ? We don’t officially open until 1 April but if you spot me shout and you can have a preview (of course all at your own peril and all that insurance stuff!). Would you like to guess about the hotel?!!!! Lovely link, I was very pleased. Hope you enjoy hearing about the garden and perhaps visit us one day. I read your lovely piece in the most recent Plant Heritage magazine and would like to forward it to my Mum in London – we visited your garden last summer. Could you email me a copy please by any chance? Thankyou! Thank you for your kind words! I will send you a copy, but it will just be text hope this is OK. Hope you have avoided the frost! This week: my new (very old) piano arrived, my cat pood on the floor (my fault I shut him in overnight), the oil tanker failed to deliver my oil, the friend who was coming to take me out to lunch died very suddenly and my fridge-freezer defrosted all over the kitchen floor – not necessarily in that order! Trying to console myself I look at planting a Magnolia and find your article about David Essex and see your cat Holly Golightly (my favourite film) and I laugh. Thank you. Whilst I do not share your passion for Essex men, I too have always wanted to have a Magnolia Grandiflora. It sounds like you needed a laugh and glad I could help. I sympathise, sometimes if it is going to go wrong it goes wrong big time. I would say that you have used up your “bad thing” tokens for a long time and you are in big credit for the “fun and laughter” ones. For a while anyway. I found you on a link from your excellent article on the Hardy Plant Society website. You have just gone into my bookmarks! Thank you, I have just read your blog and I love any debunking, too many rules, great! I can’t seem to find your gardens name and address. Could you please let me know the opening times as well. Do you have any P.volcan plants left this year? 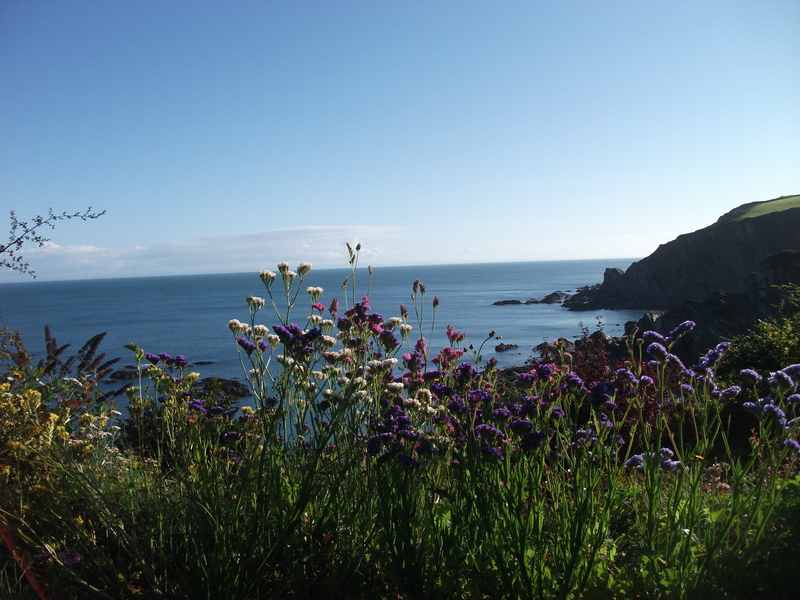 If you go to the NGS website http://www.ngs.org.uk and look up Cliffe, Lee, Ilfracombe it will give you all the details. Will check for a Volcan for you. It is a lovely spot but a little bit more wild and wooly at the moment than that photo! I am optimistic that in a couple of months all will be shiny and lovely again. Watch this space! Gill I didn’t even know that you had one! Blog I mean, now I’m hooked. Glad you found me I look forward to your comments! Thanks for liking my blog about weather prediction. I know you have your weather issues too! But they are actually pretty good these days. Even though they don’t find any blue moons. Now I understand your blog title! Thanks for following.